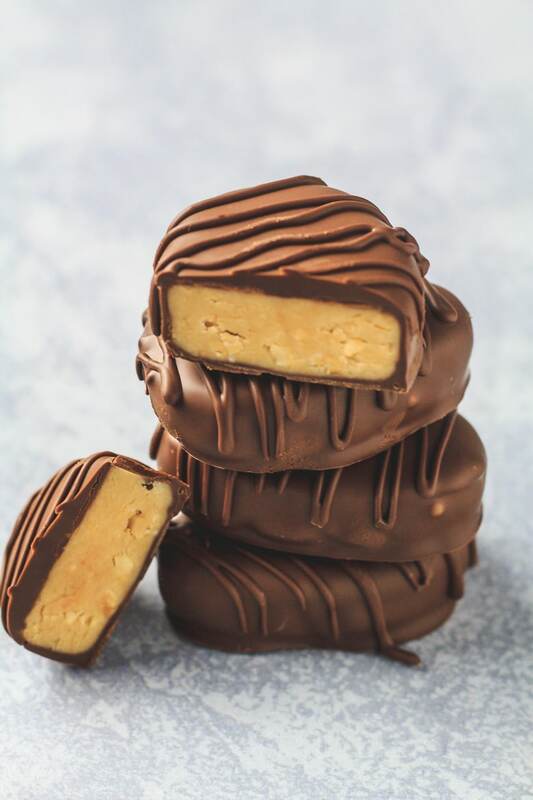 Peanut Butter Easter Eggs – Deliciously thick and creamy egg-shaped peanut butter truffles that are made with crunchy peanut butter for added crunch, and coated in melted chocolate. The perfect Easter treat! Looking for something quick, easy, and delicious to make for Easter? Look no further. 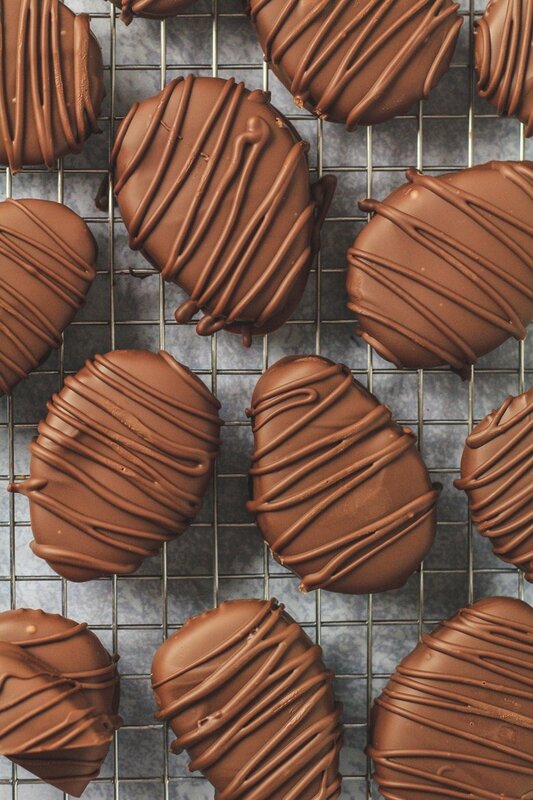 These Peanut Butter Easter Eggs are the perfect treat to enjoy this Easter. 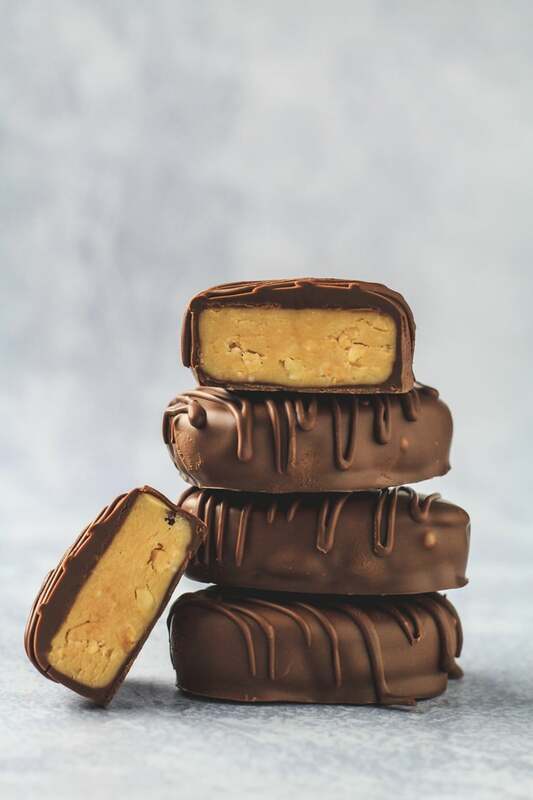 They’re incredibly creamy, made with crunchy peanut butter for added crunch, and generously coated in a layer of melted chocolate. Want more Easter desserts? Check out my Easy Lemon Tart, Carrot Cake Loaf, and my Carrot Cake Blondies. 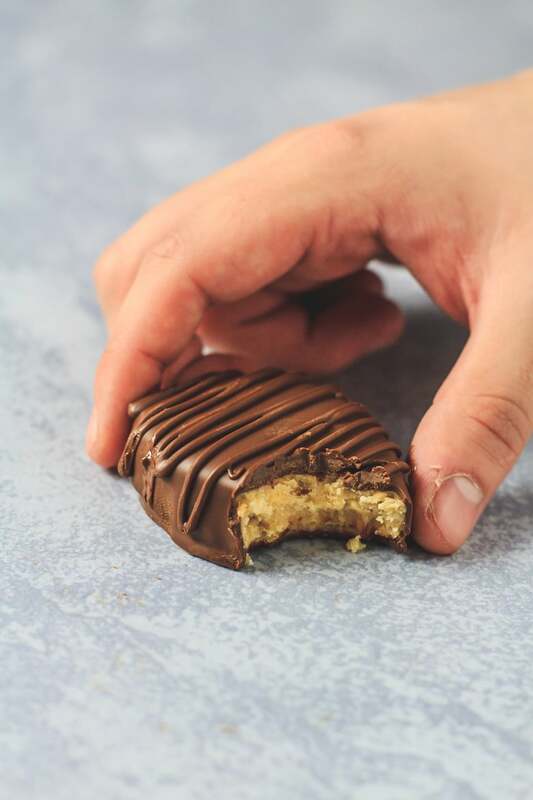 Crunchy peanut butter: You can use smooth, but I love the added crunch. Chocolate: You can use milk, dark, or semi-sweet. I used a mix of milk and dark. Vegetable oil: This helps thin out the melted chocolate, making it the right consistency for dipping. 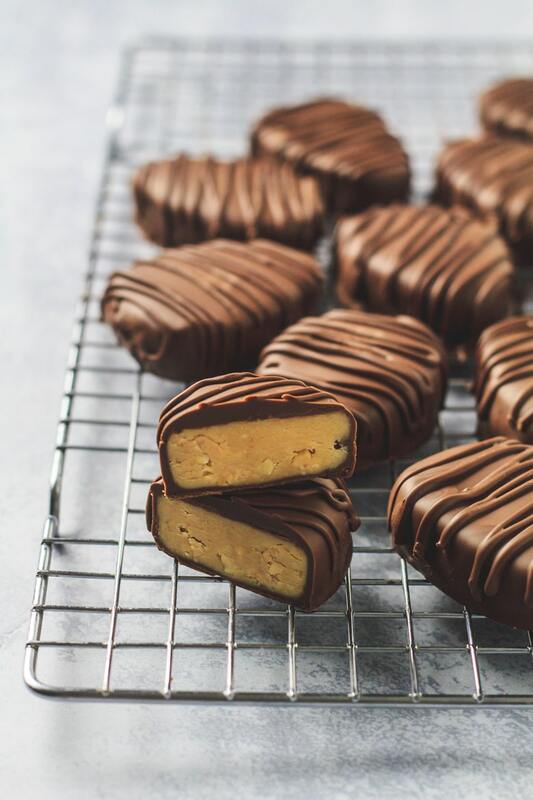 To make these chocolate peanut butter eggs, simply start by adding the peanut butter to a microwave-safe bowl, and heating it for 20 – 30 seconds until runny/pourable. Next, add the icing sugar, peanut butter, melted butter, and vanilla to a large mixing bowl, and mix until combined. This step is much easier with a hand mixer, but you can also use your hands to help incorporate everything. The mixture will be crumbly. Add the milk and mix until a dough is formed. Add more milk if the mixture is too crumbly to form. Shape the mixture into 1.5oz eggs, and place them onto a large baking tray lined with parchment paper. Freeze for 30 minutes or until firm. If desired, you can make smaller, or much bigger eggs. For the chocolate coating, add the chocolate and oil to a microwave-safe bowl, and heat in 30 second intervals, stirring after each one, until melted and smooth. Dip each egg into the melted chocolate, place back onto the lined baking tray, and refrigerate until set. Decorate the eggs as desired. I simply drizzled my eggs with extra chocolate. 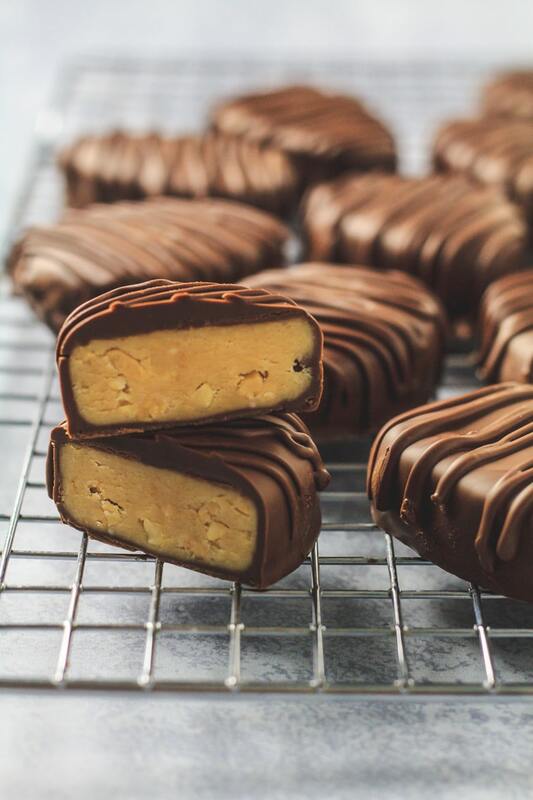 How long will these peanut butter eggs last? These eggs can be kept in an airtight container layered between parchment or wax paper in the fridge for up to 2 weeks. Can I freeze these peanut butter eggs? Yes! They also freeze well for up to 3 months. Thaw overnight in the fridge before serving. Add the peanut butter to a microwave-safe bowl, and heat for about 20 - 30 seconds until runny/pourable. In a large mixing bowl, mix together the icing sugar, peanut butter, melted butter, and vanilla until combined. The mixture will be crumbly. Shape the mixture into 1.5oz eggs, and place them onto a large baking tray lined with parchment paper. Freeze the eggs for 30 minutes. Add the chocolate and oil to a microwave-safe bowl, and heat in 30 second intervals, stirring after each one, until melted and smooth. 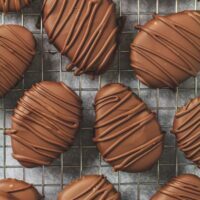 Dip each egg into the melted chocolate, place back onto the lined baking tray, and refrigerate until set. Decorate the eggs as desired. These eggs can be kept in an airtight container, layered between parchment or wax paper, in the fridge for up to 2 weeks. They also freeze well for up to 3 months. Thaw overnight in the fridge. As an Amazon Associate, I earn from qualifying purchases. Thank you for supporting Marsha's Baking Addiction. Glad to find this version; usually make the lemony ones but adding this creation to my list! Please, do I use natural or sweetened peanut butter? How do you form the eggs? Do you press the dough into a baking pan? Or do you roll it out onto a flat surface with a rolling pin using powdered sugar as “flour?” How do you get them so flat? Hi Mary! The dough is not sticky (shouldn’t be), so it’s very easy to just form little egg shapes with your hands. First, I weigh out about 1.5oz of dough (you can use less if you want), pat it down to the thickness you want, then shape them out with your fingers. Thanks, Marsha! I just made them by pressing them onto a plate and using a round cookie cutter that I bent into an egg shape. It’s very crumbly, so the dough did need a lot of warmth from my hands to keep it malleable. Very excited to make vegan versions for work using dark chocolate, almond milk, and Miyoko’s butter! When I do, I’ll tag you on Instagram. Thanks for posting and happy Easter! Awesome, I’ll look forward to seeing them! Happy Easter to you! Success! I subbed out the milk, butter and chocolate with unflavored almond milk, Melt organic vegan butter, and dark chocolate chips and they came out REALLY good! I liked them much better than the regular version I made last weekend, probably because I used Jif tonight instead of organic, natural PB. This is an easy vegan treat that doesn’t taste like sacrifice. Thank you, Marsha! These are so cute! We love them. These beautiful peanut butter Easter eggs look rich, creamy and so delightful! I’m excited to make this recipe for enjoyment on Easter morning.